I have never been a big milk drinker, but when I discovered I had an auto-immune disorder and my body couldn't tolerate it any longer, I kind of felt cheated. I don't like being told no, especially by my own body, and that made me angry. I still need it occasionally for my cereal or to cook with, so my doctor suggested some milk alternatives, like soy milk. My first impression of soy milk? Blech! Does anyone else think it tastes like baby formula? Not good! I decided to try almond milk next, and thankfully, it was love at first sip! I actually found that I liked it even more than regular dairy milk. 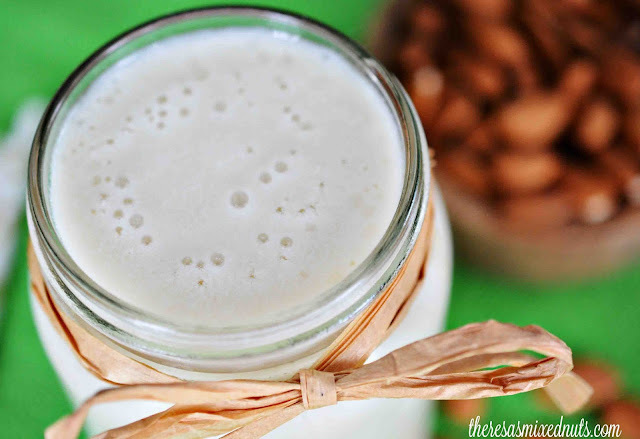 While recipe surfing on Golden Blossom Honey, I found a homemade Fresh Almond Milk recipe that brought out the diy guru in me. I don't know why I never thought to make my own before, but once I found out how simple it was, I just had to try my hand at it. This came out a little thicker than store bought, but I find that makes it an awesome base for smoothies! If you don't like it thick, just add a bit more chilled water and you are good to go. I did use a drop of almond extract for flavoring, which was super tasty, but I think I'll try vanilla on my next batch since I really love the vanilla flavored almond milk that I buy from the store. What kind of milk do you prefer? Dairy, soy, almond, coconut, rice? I like almond or cashew milk. I usually have a 1/2 gal of dairy around for Travis though. I haven't tried cashew milk yet. Cashew is my favorite nut, so I bet I'd love it. I still have to buy dairy for the rest of the family because they are sticklers for keeping with what they know. I haven't been able to successfully convert them yet. I can't drink regular milk either. We have soy and almond milk in some of the better shops but they're awfully expensive and so is almond. Our soy and almond milks can get expensive here, too. If you aren't brand loyal, you can usually find it on sale most weeks for about $3 for a container. Around the holidays, almonds usually go on sale, so I stock up and vacuum seal them for freshness throughout the year. That would be a cost effective way to make your own almond milk. I can't even look at milk without want to throw up. My body can't handle it what so ever. I can't drink milk with my asthma. I will have to make this and see if it bothers me. I would love to be able to eat a bowl of cereal. I actually have made this for the kids before. My husband and youngest son are lactose intolerant and I found out instead of buying it all the time that I could make it myself. They loved it! I have always wanted to try to make my own almond milk. It is one of the things I use daily in my shakes. I will have to give this a try tomorrow. So that is what baby formula tastes like. YIKES! Angie the Bollywood Princess makes her own almond milk on a weekly basis. "Don't touch my almonds!" I know, but I'm not demented. Not yet, I'm not. This sounds interesting. My daughter loves almond milk. Will try this! I never thought to make it myself either!! I'm thinking about it now!! 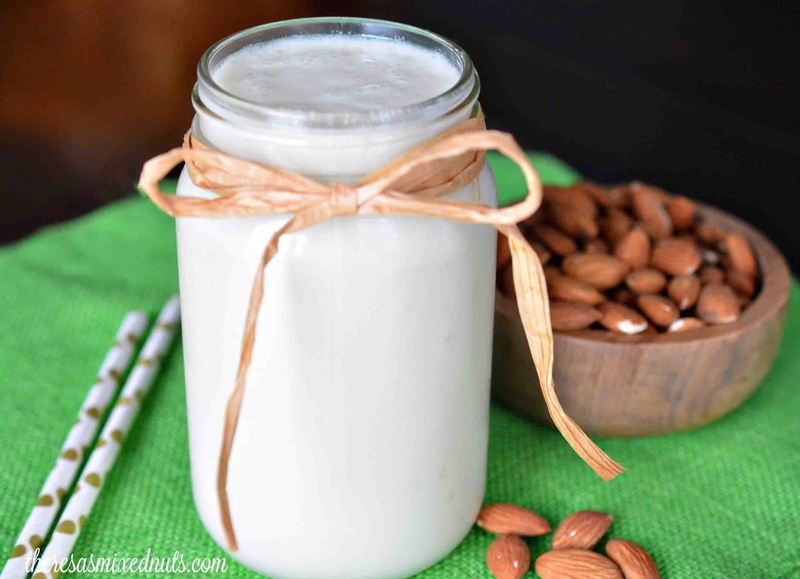 I have really been thinking about starting to make Almond Milk here at home. I can't believe that it is so easy to make and I know that it will save me some money at the grocery store. Yum! Never would have thought to make almond milk at home. Looks thick and rich! I had no idea this was so easy to make! I like to bake with almond milk a lot! I need to make this. I hate paying the high price for almond milk.